After many years of pioneering work in the field of food hygiene in the USA, Bernd F. Podzus successfully launched “tailor-made cleaning systems” in Switzerland. The company, Podchem, was founded by Bernd F. Podzus in 1973. The company is still owned by the family today. Because, in 1973, there was no foam application equipment that satisfied the company’s demands, the company developed and manufactured its own piece of machinery. 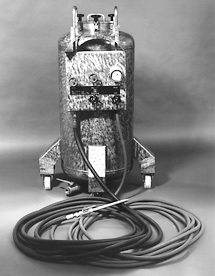 There were two versions, 75 litres and 150 litres capacity. The entire pressurized container was made of V4A stainless steel! Some pieces of equipment are still used today and can still be modified by us as we have a store of spare parts available. In 1980, the company relocated to new premises at the current site (5 minutes to Schaffhausen). to then on, the laboratory and manufacturing plant were no longer separated, making quality inspections easier. The cleaning products we manufacture measure up to the intensified cleaning demands in all areas of the food industry. We have a wide spectrum of cleaning products of the highest quality. In particular, we guarantee that only raw materials of the highest standards are used to process and manufacture the cleaning products. When used properly, this ensures unbeatable low bacteriological values.